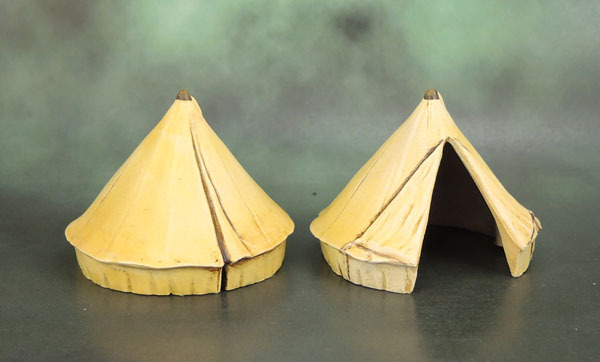 Renedra Generic Scenery: Tents | Azazel's Bitz Box. Vikings provide “human scale”, while the side-by-by-side of the tents shows their own size variation. By now, regular readers will know of my fondness for scatter terrain and especially terrain that is reasonably generic, so that it can be used in a variety of settings. 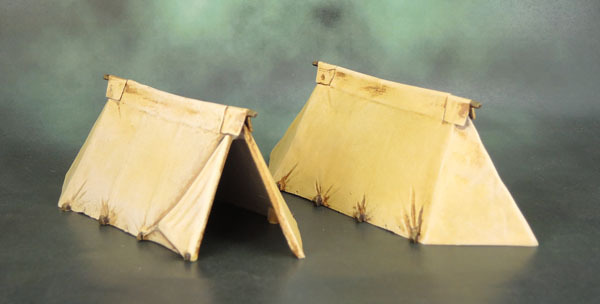 With that in mind, and an eye to “fill in” a bit of a hole in my scenic collection, I picked up a set of Renedra’s Saxon Tents and 2 sets of Mixed Tents awhile back, in June of last year. This combination of purchases giving me two of each tents open, and two closed – enough for a couple of small camps or one large non-uniform encampment. I finally decided to get them done and batch painted them during January, with a base of cream spray paint, drybrushes of bone, a spray of Plastic Soldier Company’s weathering spray and an alcohol wipe-off, another drybrush and some brown lining for tent flaps, and then doing the pegs. Pretty simple overall, but unfortunately they came out a fair bit more yellowed than I’d planned. I went for a yellowish linen because again – I wanted them to be generic rather than tied to Vikings or Saxons or WWII GIs or whomever. For the same reason, I declined to base them. This way I can lay them down on whatever tabletop surface I’m playing on and they’ll still look decent. Here they are on the Badlands Mat I recently reviewed. 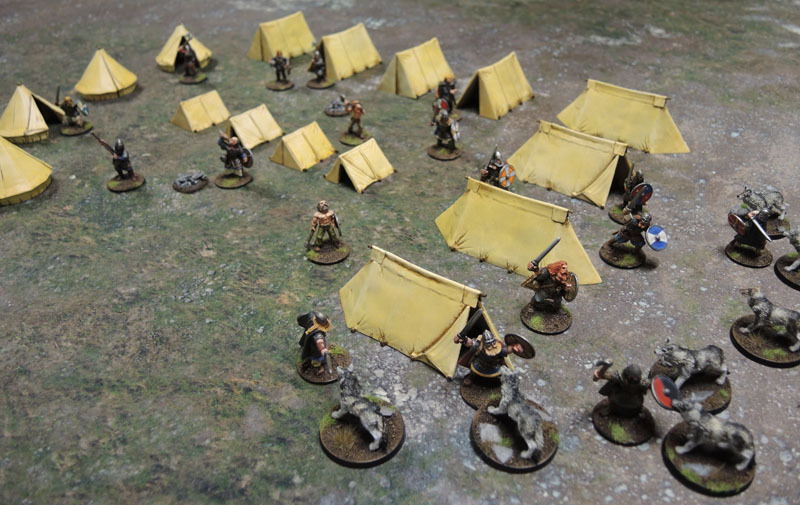 A feral and savage wolfpack attacks a Viking encampment. Insert “Who let the dogs out?” joke here. Just a couple of shots showing them set up on a table. I actually remembered to add in the little campfires here as well. 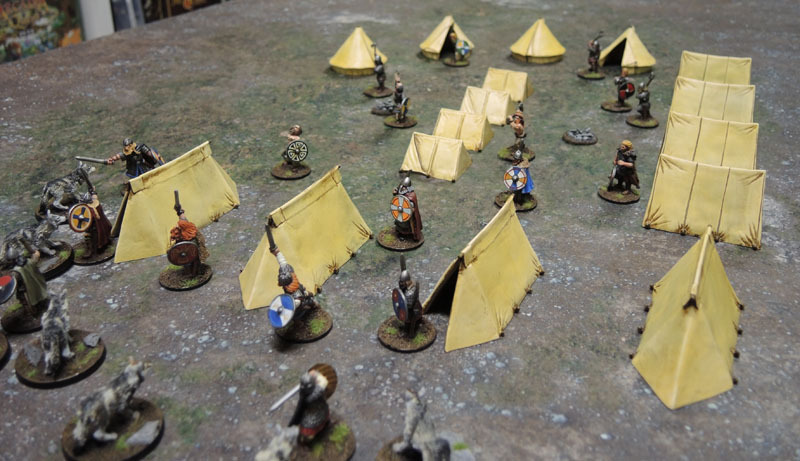 This entry was posted in Vikings, Wargame Scenery and tagged Renedra Tents. Bookmark the permalink. Interesting addition to your collection. Strange really that camps are not more common in wargaming terrain. 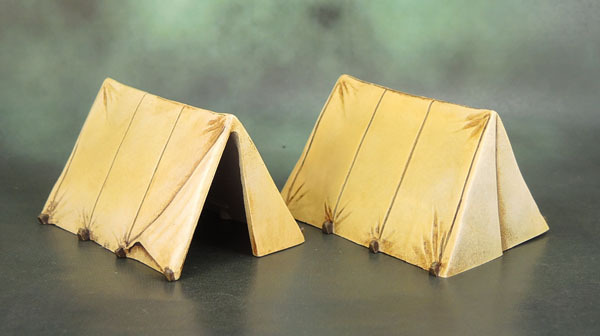 One of my local games stores had these Renedra tents on the shelf for years now, and I have looked at them many times. Now I might finally buy them, seeing how well they can turn out. Agreed. I guess they’re “left behind” in many games as the troops march to battle – but I wanted something that could work for different scenarios and historical games. I’ve got plenty of 40k and even modern-ish stuff, so it’s a small gap easily filled. I’ve had those dog tents for years now, might finally paint them up. Really liked your finish, I don’t think it’s too yellow at all! Thank you Mikko. I have to say they’re bloody easy to get painted (especially if you start with a spray can). It’s just a matter of getting around to knocking them out. Great additions mate, and, for what it’s worth, I reckon the colour is spot on! Thank you Alex. I just pictured them as a litttle more sun bleached. That’s true, they’d also work well in smaller scales. All I plan to do in smaller scales though is one day get my Flames of War 15mm models up and running again. One day. These are pretty neat and I agree with the comment that it is surprising one doesn’t see more camps and such in wargames, especially historical ones. Yep, I guess that given the scope of a lot of historicals they struggle just to get all of the models on the table, especially at this scale. They’ll work well for the skirmish side of it, though. I played a GMed game of the Battle of New Orleans a a few years ago which featured a lot of tents, though it was 15mm. I could see where your bigger tends would indeed work well in a skirmish game but might be too big to deploy en masse. A sprinkling of them, especially near a table edge, which could be assumed to be the edge of a larger off-table camp would certainly add flavor and interest to the table. Yep, that’s pretty much the plan along with the odd small encampment as in the photos. Maybe some potential RPG use as well at some stage. Excellent addition to your scatter terrain. The colour of the linen is good in my opinion, especially if we assume it was treated with wax to fend of rain. I would go so far and recommend even heavier weathering with more dry pigments and maybe a fallen leave here and there. Those will work great as camp element or mission objectives. 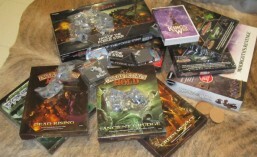 If you play RPG’s they will also come in handy for the “Attack at nightfall” encounter. Oh! There you’ve done it! Thank you! I’ll do some pigment weathering on the bottom edges similar to the Rackham walls. That will probably add enough variation from the monotone that I stop looking at them funny all the time (and mute the contrast between the pegs and canvas that bothers me). 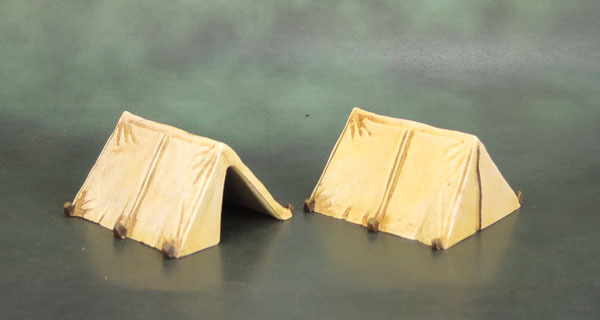 Pingback: Mantic Terrain Crate – Pup Tents (February Terrain 2019) | Azazel's Bitz Box.